In this Photoshop tutorial I decided to create an interesting "2014" text effect using some wood, vintage, grunge textures to give that old look feel. As for the background we'll be using a theater stage with beautiful old style curtains. In the end we'll put the stage inside an old teared photo frame to create our vintage card. 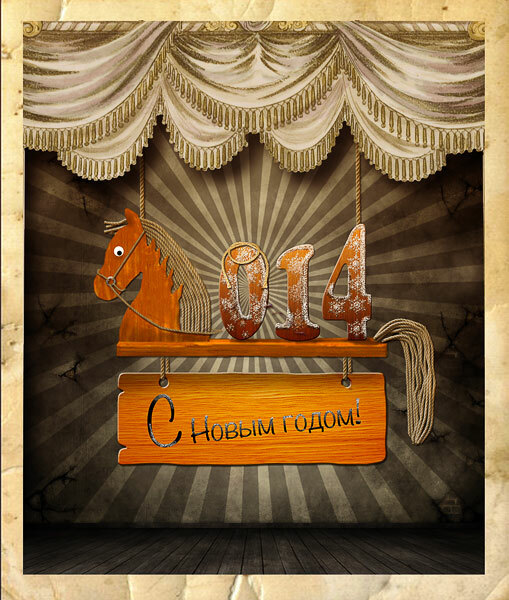 In this tutrial we are going to create in Photoshop an old vintage greeting card for the New Year 2014. In the chinese horoscope the 2014 is the year of the wood horse, so starting from this we are going to design the greeting card. Start with this old room as background for our theatre stage. Use the Rectangular Marquee Tool to make the room taller. Select part of the room wall and ceiling and move them up. Select again part of the wall and duplicate it to fill the gap. Merge the two layers. Use the Clone Stamp Tool to make the merge of the two wall surfaces seamless. Add an Exposure adjustment layer with these settings t0 darken the image a little. Remove the bottom part area like shown in the image and use a copy of wood to make the toy longer. In a new layer I will add the numbers "014" to create the year 2014. I will use the Intro Font, which is a free font type. Learn how to install font in Photoshop. Also don't forget to paint a shadow effect under each number using the Brush Tool. You should obtain a similar result. Use this rope to hang the wood sign. I will use some adjustment layers only for the rope. Also add an Inner Shadow effect. Use another rope image to add it like shown in the image. You have to add again adjustment layers to match the color tones, brightness/Contrast, etc. Now we have to add a Drop Shahow effect for the wood sign. For that you have to select all the layers of the wood sign, duplicate and merge them. Place this layer below all the other layers and add it a Drop Shadow effect. For the final touches I have added this theater curtain; you have to add a Drop Shadow effect. To blend all the elements together you can add a Gradient Map like shown in this quick tutorial. 1 comment(s) for "Happy New Year Vintage Old Card Photoshop Tutorial"